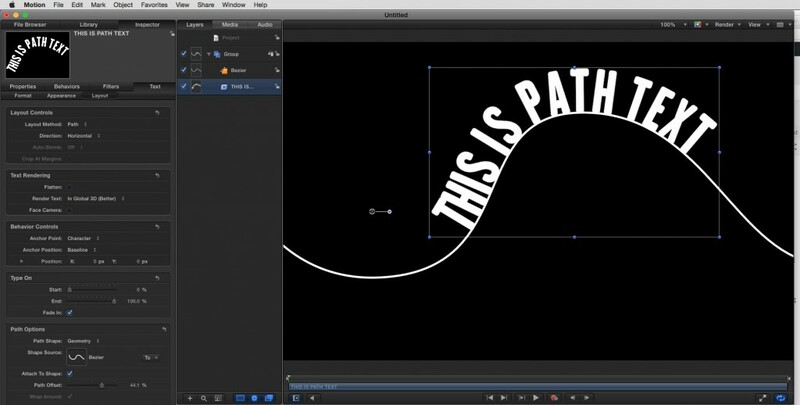 In our last lesson, in our look at Apple Motion 5, we talked about the creating Path Text inside of Motion 5. In this lesson, let’s continue our look, but let’s talk about creating our own custom paths to work with. First things first: We will need a path. Most people will tell you that you’ll need a closed shape path, but that’s just not the case. Let’s draw a simply squiggly line, and I’ll show you how to set up your text to ride along the top of it. Don’t worry, this will make sense in a second. With the new Bezier layer selected in your group, head to the Inspector, to the “Shape” tab, and then to the Style tab, and turn the Fill Opacity down to zero. Now, instead of having that weird shape, you’ll be able to see your path. Now, select your text again, and in the “Path Shape” dropdown, select “Geometry,” and then drag the Bezier layer into the Drop Zone. Next, you can simply turn off the Bezier layer, and drag the path offset parameter, and you’ll see your text moving across your spline, exactly as you needed it to. Be sure to check out our list of Apple Motion 5 – 101 tutorials here. You can pick up Motion 5 [iTunes link] and Compressor 4 [iTunes link], only $49 each. 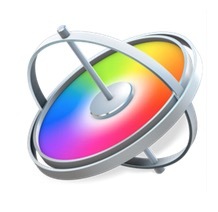 You can also check out Final Cut Pro X here [iTunes link], it’s only $299 and there is a free 30-day trial available.